Defending champions Team Wellington earned the right to host a semi-final against Canterbury United in dramatic fashion while Auckland City have secured the minor premiership and will welcome Eastern Suburbs in the other knockout meeting. Going into this weekend’s final round of the regular ISPS Handa Premiership season, all four play-off participants had already been found but the minor premiership was still to be confirmed, as was the venue of each semi-final. 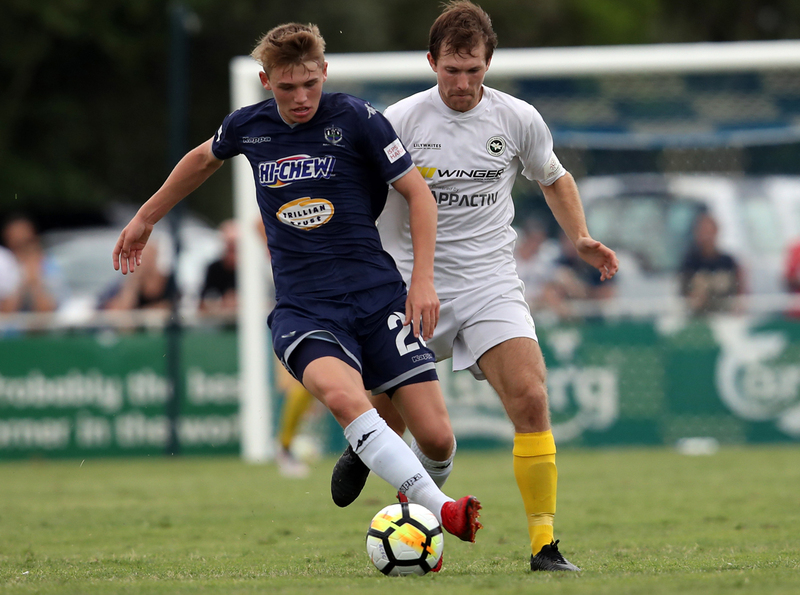 Auckland City took care of two of those questions marks on Saturday against the Wellington Phoenix Reserves, claiming their fifth consecutive minor title and ninth overall with a 2-0 win. In a match that served as a curtain raiser for the later A-League game between the Phoenix and Newcastle Jets at QBE Stadium, the Navy Blues showed no signs of stumbling at the last hurdle as a first-half double from talismanic goal-grabber Emiliano Tade put them firmly in control. The Argentine’s first arrived with a cool finish past Oliver Sail in the 36th minute while his second came just a few moments later and was one for his personal highlights reel, Tade letting rip with a superb effort that found its way into the top corner. The brace took his goal tally to 16 for the season and earned him the Premiership golden boot award for the second time in his career. The result was also notable for the fact that City kept a remarkable 11th consecutive clean sheet in all competitions – they have now gone for over 1,000 minutes without conceding a goal. “Winning the minor title is the product of all the effort, all the hours of what we’ve all put in,” Auckland City coach Ramon Tribulietx said. The scoreline may have been higher if not for the performance of Phoenix goalkeeper Oliver Sail, who pulled off several outstanding saves to keep his side in the contest. But interim coach Steve Coleman was pleased with the effort put in by a particularly young ‘Wee Nix’ line up. “Despite the result, I’m really pleased with the way the boys went,” he said. Auckland City will now host Eastern Suburbs in next weekend’s semi-finals after the latter suffered late heartbreak in a vital encounter against Canterbury. Suburbs had home advantage in a match both sides had to win to have any chance of earning a home semi and took an early lead when Derek Tieku tucked in from the penalty spot. Danny Hay’s men must have thought they’d done enough when there was still no further scoring with a few minutes remaining but the wheels then came off in a thrilling finish, Jacob Richards and Francis De Vries both pouncing late to take the points back to Christchurch. Amidst all the drama, All Whites midfielder Moses Dyer was sent off after receiving a second caution and will now miss the semi-final. Suburbs will also be without top scorer Andre De Jong, who headed to Australia a couple of weeks ago, and Tim Payne, who will be in Spain with the All Whites. Auckland City will likewise not be at full strength though as Cam Howieson will be with Payne in the All Whites camp. “It was very disappointing, we knew they’d keep coming at us because they did that last time we played them down there and got the same result,” Hay said of his side’s last-gasp defeat. Despite leaving it so late, Canterbury coach Willy Gerdsen felt the Dragons were deserving of the points. “It was quite a scrappy game overall but I thought we dominated possession and deserved to win to be honest, I’m very proud of the team,” he said. Saturday’s win put Canterbury in with a shout of hosting their semi-final and it looked like that may very well be the case as Hamilton Wanderers were surprisingly holding Team Wellington at 2-2 with just seconds left on the clock on Sunday. Hamilton, who had won just once all season, had gone two goals down early on as Andy Bevin and Jack-Henry Sinclair both netted to put Wellington on course for what seemed a comfortable afternoon in the capital. But the visitors had other ideas, rallying in the second half through Xavier Pratt and Armin Pasagic to level the scores. The Canterbury players must have been dancing around their living rooms at that stage but their bubble was soon burst as Bevin added his second with three minutes remaining to spare Wellington’s blushes and secure a place in the top two. “We knew what we had to do today after the results yesterday and the most important thing was securing that home semi-final,” said Wellington coach Jose Figueira, whose side are chasing a third title in-a-row. Both semi-finals of the Premiership will take place on the coming weekend with Auckland City hosting Eastern Suburbs at Kiwitea Street and Canterbury United travelling to David Farrington Park to take on Team Wellington. The final will be played a week later at QBE Stadium in Auckland.